I realise this isn’t out yet, but I may have said before in some long lost post that I saw this with the E4 Slackers Club at our Picturehouse Cinema in York. And I promise not to give anything away if you haven’t seen it, but it’s SO DIFFICULT! IT’S SUCH AN AWESOME FILM, I CAN’T GET OVER ITS BRILLIANCE AND THE EPICOSITY OF IT. Okay, okay, I’ll stop with the caps. BUT IT’S JUST SO GOOD. 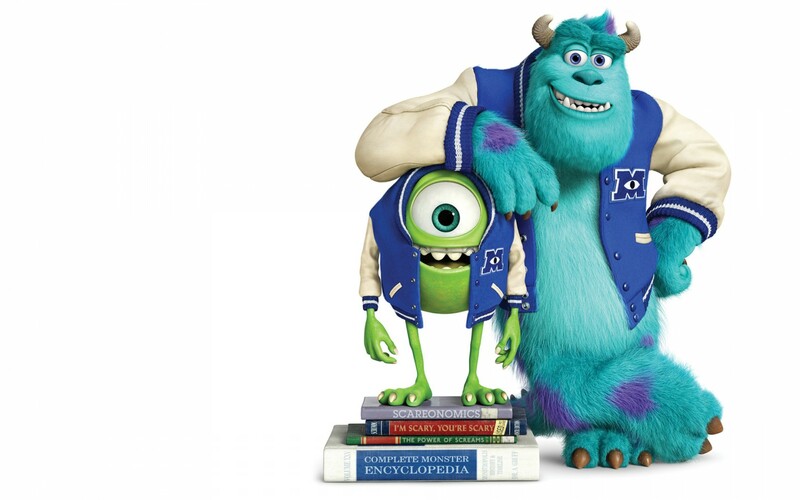 It’s amazing in the way that you get the back story of an awful lot of the characters, not just Mike and Sully. And you get to see baby Mike who is ADORABLE BEYOND BELIEF. But seriously, it’s such a clever little film. I heard one person say they don’t really see the point in the film because there isn’t a significant bad guy/villain type person but I really don’t think that’s part of the message that Pixar is sending us this time around. It’s about learning about who you are and who you’re supposed to be, or perhaps more accurately, who you’re not supposed to be. It tells us gently that even though we may like something, or even though we may want to do something with our lives, we might not necessarily be cut out for it. But it’s not saying that this is a bad thing at all, of course it isn’t. It’s just suggesting that (by going to university) we need to take the time to discover what our purpose in life is. Phew, this is getting deep. In true Pixar fashion, it’s bright, it’s colourful and it’s created with the utmost care and attention to detail. It’s beautifully made and the scripting is pure genius and I was laughing so much all the way through. ALSO! (Can’t believe I nearly forgot about this) The short at the beginning of the film is my favourite Pixar short so far. I’ve loved every one that they have done including Knick-Knack and the one with the birds on the telephone wire – I forget it’s name, sorry! – but this one hits new levels and takes on a whole new idea. It also looks quite different from the usual Pixar animation which really sets it apart from the others for me. Monsters University, I would say, isn’t as amazingly brilliant as the first one primarily because that was so original and BWAHH THIS IS AMAZING, but I think it’s equally as clever and creative. It’s also very significant for people of my generation, seeing as a lot of us are either starting, attending, of have recently experienced university. It’s very easy to relate to the film as a student because you see all the aspects of university life (even though it’s a uni across the Atlantic) like the societies and the first day of lectures and moving into halls of residence. It’s just perfect! And I think they made a very smart move by releasing this movie so many years after the first one when all of the original fans, as young and equally adorable as we were, are grown up and so, so ready for another film. Toy Story 3 also did it right by getting Andy to leave for college and make the ridiculously tough decision of clearing out his toys. God, dem feels. Pixar just get it right! Damn you for making me feel all gooey inside, I’m supposed to be made of stone don’t you know?! But back to the film. Please go see it. I know there’s a few more days til it comes out in the UK, but please, for the sake of your soul, go and watch it. I don’t want to give it a 10/10 purely because nothing’s perfect, so I’m labelling it a 9.5/10.